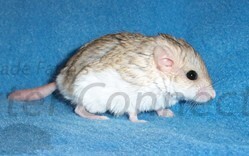 Duprasis are cousins to the Mongolian Gerbil which is commonly found in pet stores. Duprasis live in social colonies in the dry, gravly plains of the north Sahara Desert regions of Egypt, Liberia and Western Morocco (Nowak). Duprasis inhabit dry, rocky or sandy areas where they find shelter under bushy vegetation, in cracks and crevices, and beneath large rocks. Duprasis are diurnal which means they alternate short bursts of daytime activity with periods of sleep throughout the day. Their typical body length is three to five inches from nose to base of the tail with a tail length of two inches. The club shaped tail is the most interesting feature of the duprasi. The tail is used to store food and water in a manner similar to that of a camel. A fat or plump tail typically indicates a healthy animal. If the duprasi is dehydrated the tail will shrink and wrinkle. Nursing females and young duprasis typically have a thinner tail. Duprasis are short, chunky animals with small, thin legs. Their legs may break easily if they are dropped or caught in a wheel. They have long glossy hair and most duprasis enjoy dust or sand baths to help remove the oil from their coat. Most duprasis are very calm and docile. If handled frequently they are normally easily tamed. Some duprasis like to lie on their back in the palm of your hand and have their bellies rubbed. We have read on many websites that duprasis “never” bite. As a general rule, any animal with teeth has the potential to bite if they are startled, feel threatened, or if they are checking out a new smell in their environment. Our duprasis are friendly and enjoy being handled. Some will give warning nips but none are aggressive biters. We prefer to house our animals individually, but male and female pairs or female pairs are suitable combinations. Two males may get along or they may spontaneously start fighting when establishing dominance. Duprasis housed as pairs should be introduced to each other at a very young age or only for breeding purposes to prevent fighting. Duprasis make excellent pets since they are relatively neat and clean, have little odor, are fun to watch, and are relatively long lived. Glass aquariums are ideal housing for duprasis. A 5.5 gallon aquarium is adequate for a single duprasi and a 10 or 15 gallon aquarium will provide sufficient space for a pair. Typically, the more room you can provide your pet the better. A tight fitting lid is a good idea even though duprasis are not very good jumpers and are not as good escape artists as other rodent cousins. Habitrails or other plastic tubes and tunnels systems may be used as their primary enclosure but it should be checked frequently for chewed areas. Food dishes are not absolutely necessary because duprasis tend to eat only the top layer of food and do not dig down into the dish. A dish, if used, should be a shallow ceramic or crock style dish. A wheel is a good addition to a duprasi cage. Solid bottom rodent safe wheels are always better than wire rung wheels. Two wheels per cage should be provided if there are more than one animal in a cage. Activity helps to keep them from becoming obese. Accessories may include a clay flowerpot, toilet paper tubes, PVC tubes, and objects to hide under. Duprasis enjoy hiding places and will typically spend their sleeping hours in seclusion. Pine or aspen shavings or some other wood product are the most commonly used beddings for duprasis. Never use cedar shavings because the oils and dust from cedar can be harmful to small mammals. Deep bedding will provide duprasis with an opportunity to burrow and tunnel but you may often find your duprasis sleeping on its back in the corner of its cage. Dry non-clumping kitty litter has been suggested by some duprasis owners as a substrate that is similar to their natural environment. Duprasis are mainly insectivores in the wild. Many people use a seed mixture such as a hamster food mix or parrot seed mix with dried fruits and vegetables in captivity. Kitten, cat, or dog food can be used for supplemental protein. Duprasis also enjoy dark green leafy vegetables (collards, Romaine lettuce, spinach, dandelions), tubers such as carrots and sweet potatoes, and fresh green beans. One should be careful not to give them too many greens because it may cause diarrhea. Duprasis love crickets, mealworms, beetles, and most other insects. Mealworms have a high fat content and should be fed in moderation. They can become obese fairly easy since duprasis love high fat foods such as seeds and nuts. Keep your duprasis out of drafts and at a reasonably warm room temperature. A comfortable temperature is 70F to 80F. Duprasis can withstand warmer temperatures better than cooler temperatures since they come from the desert. Most duprasis will breed all year round. Some people have consistent success but we have found that duprasis are more difficult than other rodents to breed in captivity. Both male and female will stand on their hind legs during breeding and do a boxing type ritual while squeaking at each other. Occasionally they will become so aggressive towards each other that the male and female need to be separated before breeding occurs or shortly after breeding. We have found that it is best to remove the male after breeding when the female begins to make a nest so that the female doesn’t stress during the raising of her babies. Gestation for duprasis is 18 to 23 days with litters ranging in size from 3 to 6 babies. Babies are typically weaned at 18-28 days. Life expectancy averages 3-5 years but they may live up to 6 years. The most common health problems are obesity and injuries related to fighting.